“I am Andrew Ryan and I am here to ask you a question: Is a man not entitled to the sweat of his brow?” So begins the player’s descent into the underwater dystopia of Rapture, an art deco world choking with Ayn Randian political philosophy and steam-punk scientific wizardry. 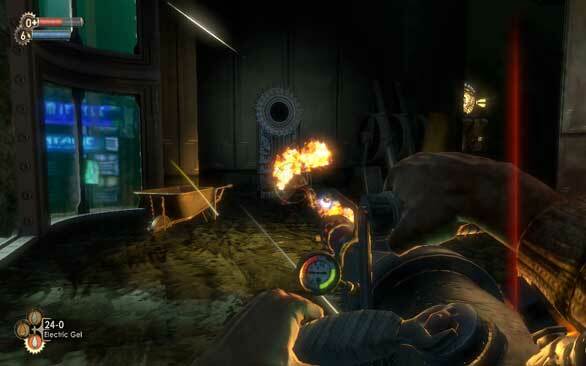 Bioshock was the breakout first-person shooter of 2007 and has become arguably the most anticipated port to come to the Mac platform this year. First developed by 2K Games and ported to the Mac by Feral Interactive, Bioshock is one of the most engrossing gaming experiences to hit stores in the last decade. Set in an alternate timeline where an American tycoon sought to free himself of “parasites” like government and religion by building a perfect libertarian city under the sea, Bioshock quickly becomes an analogy for extreme Randian philosophy just as George Orwell’s 1984 was an exercise in the evils of communism. 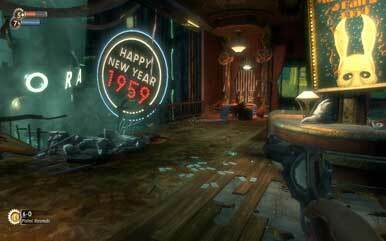 Set in 1960, you play as the sole survivor of a plane crash who stumbles upon Ryan’s underwater city, Rapture. Rapture was initially a haven for scientists and inventors who discovered staggering breakthroughs such as ADAM and plasmids-tools that enabled humans to rewrite their genetic codes. The player discovers several of these plasmids and uses them to navigate the shattered remains of the city. Some plasmids are passive abilities that help you get stronger or smarter, but others are active weapons that allow your left hand to shoot lighting, fire, and even bees! Though it’s a bit difficult to switch between plasmids and conventional weapons like pistols and tommy guns in the middle of a firefight, plasmids are essential to survival and provide a RPG-like level of customization uncommon in a first person shooter. If you don’t like the keyboard assignment of your hot keys, it’s really easy to modify it in the options menu. There are few titles out there that are as creepy as Bioshock. It’s not simply the crazed splicers and their disheveled appearances. It’s not that stumbling around the world suggests you’ve actually arrived after the really horrific things happened on that fateful New Years Eve in 1959. It’s not the random ghosts that both humanize the game (often times you’ll encounter random citizens just trying to make a living) and also scare the s--- out of you for changing the screen to blacks and whites in a random flash. And it’s not even the multiple brilliant citizens you’ll encounter whose visions have been twisted to madness (the surgeon level and encounters with the artist Sander Cohen are particularly eerie). It’s the combination of all these factors with the moral decisions you’re faced with when confronting the source of ADAM in Rapture. In one of the most disturbing displays of scientific genius gone awry I’ve ever witnessed in science fiction, it seems that scientists in Rapture decided to implant sea slugs in the stomachs of little girls to make them into little ADAM factories. The brainwashed little girls look sickly as they wander around Rapture, each one carrying a huge syringe and gleefully dancing around dead bodies as they extract ADAM from the dead before drinking it (yeck). Just like the splicers, you need the ADAM that the little sisters carry and the only way to get it is to first kill the Big Daddy, a heavily armored genetically modified soldier in a diving suit, and then either harvest or rescue the little sister. This choice, between killing the little sister and saving it, will determine how much ADAM you receive and what kind of ending you receive when you finally beat the game. Unfortunately, the choice is rather black and white—the three endings are essentially divided into the good, bad, and really bad endings. You actually don’t lose that much ADAM by not harvesting the sisters as you’ll be given gifts of thanks for saving their life. In my opinion, while it was touted at the time, the moral choice aspect of the game is a small distraction rather than integral to the overall gameplay. The plot twist, on the other hand, rivals The Usual Suspects in terms of paradigm shifting significance. Don’t want to reveal it here, obviously, but its integration and execution are simply magnificent. 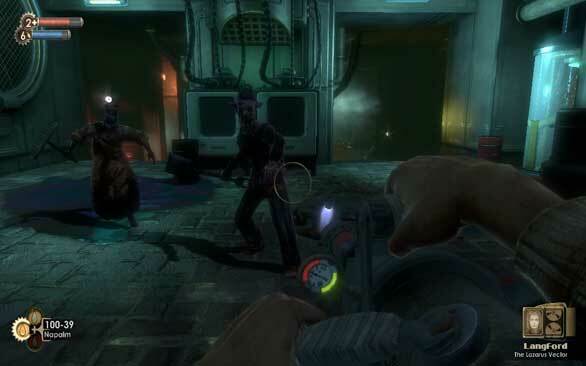 The other innovations in Bioshock are translations of many elements found in System Shock 2, Bioshock’s spiritual predecessor. You’ll be able to hack turrets, safes, and security cameras with a plumbing minigame that is by far the most annoying aspect of the game. You’ll need to hack a lot and it never becomes fun as it takes you out of a compelling world and puts you in a boring and predictable one. Plus, I refuse to believe that a steam powered gun turret can distinguish between good guys and bad guys. I’ll buy sea slugs that can change your genetic code but I draw the line at morally (or genetically?) aware cameras and turrets. I also had difficulty buying the plethora of vending machines you encounter throughout the city, including those that sell ammo and health, healing stations, gun upgrade machines, gene swapping banks, vita chambers (that will resurrect you when you die) and many other weirdly helpful machines throughout Rapture’s diverse landscapes. A city that has vending machines selling bullets every few yards is just asking for trouble, in my opinion. Still, you really do feel like you’re in an underwater city—you’ll see beautiful whales and fish swim around the tubes connecting the different buildings. You’ll encounter apartments, sewers, underwater forests, restaurants, entertainment areas...and the frightening things that now dwell in them. You’ll overlook some inconsistencies in the plot—like how you can be resurrected in a Vita Chamber while seemingly no other character can and your body was nowhere near the chamber when you died—because the world is simply so far out that you’ll just enjoy the ride. You’ll also get over the sometimes awkward switching between weapons and plasmids during combat because the addition of plasmids opens up some clever problem-solving abilities and no one is going to complain if you’re allowed to shoot bees out of your hands. On my 2.66GHz Core 2 Duo MacBook Pro, Bioshock ran beautifully. Crisp frame rates and the 2007 graphics are still rendered in impressive detail. Feral Interactive deserves props for porting such a fantastic title to the Mac platform. 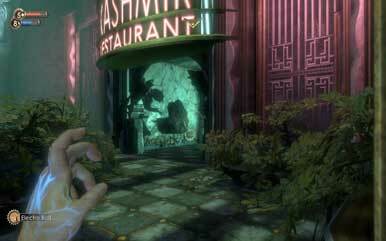 Bioshock was originally released on other platforms before the famed 2007 Fall launch period where several critically acclaimed first person shooters were release (Call of Duty 4, Crysis, and Team Fortress 2 included) but Bioshock never seemed to get the attention it deserved because it didn’t contain a multiplayer component. Instead, Bioshock’s engrossing story and original vision combine to make a unique gaming experience as haunting as it is beautiful.